Strap in and hold tight — you’re about to be teleported into a 360-degree rendering of the center of the Milky Way galaxy. The ultra-high-definition visualization comes courtesy of data collected by the Chandra X-ray Observatory, a space observatory that launched into orbit in 1999. NASA’s Ames supercomputer rendered the data as a stunning simulation you can experience from the comfort of home. “This visualization shows the effects of massive stellar giants blowing off powerful winds in the region around the Galaxy’s supermassive black hole,” NASA said in a statement. 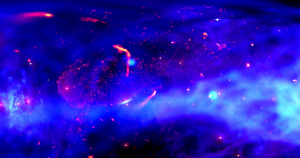 In the video, you can watch gases emit X-rays and see outbursts from gases that are near black holes. According to the NASA release, these gases are tens of millions of degrees Kelvin. NASA hopes to use the animation to study the environment around black hole.